There are many people with addiction to alcohol, and in recovery from substance use and opioid use disorders who are unaware of their civil rights under the ADA. Our goal is to explain their rights and responsibilities to them. 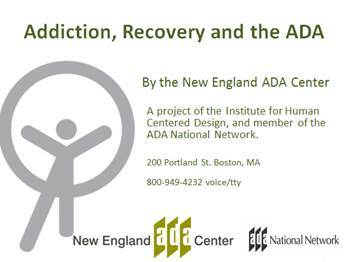 The ADA applies to alcohol addiction and the illegal use of drugs, differently. The PDF below explains these differences through scenarios about: alcohol, opioids, cocaine and marijuana. It also addresses how the ADA applies to persons who become addicted while using a legally prescribed drugs like Percocet. This is a very complex subject due to emerging court cases. The PDF will be updated as cases emerge and law develops. Copyright © 2018 Addiction, Recovery and the ADA. You can freely reproduce and distribute this content. Include proper attribution. But you must get permission before using this content as a fee-based product. Funded by NIDILRR Grant # 90DP087.